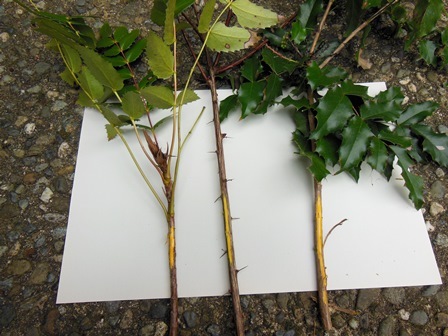 Cut surfaces of three related plants – Mahonia nervosa, Berberis thunbergii, and Mahonia aquilfolium – showing the yellow interiors. You think sun, you think yellow. You think sunflowers, you think yellow. So much yellow around us from road signs to advertising, and—there’s more yet! Hidden beneath bark or within roots, a number of plants are awash with golden colors too. When I transplant or prune a barberry or a Mahonia (now termed Berberis), I’m struck by the beautiful yellow coloration of the roots and stems these plants have. The Oregon grapes and related species have wonderful, bright yellow blossoms, but that appears to be just a coincidence, as other plants with internal yellow might have white blossoms or very different floral structures, as in the case of Alaskan yellow cedar. So what is the purpose, if any, behind this internal coloration? Does it affect edibility for humans and/or animals? For a plant to put energy into producing something that its immediate neighbors don’t have is often an indication of there being some value in warding off predators, such as insects and/or other herbivores. This topic begs to be researched as not much is written about it except from an herbalist’s or pharmaceutical perspective. Many of these plants with interior yellow coloration have the compound berberine, an alkaloid that is associated with a variety of herbal and modern medicinal remedies or attributes. Depending upon which society has recorded their usages, you will find claims of effectiveness against various human fungal infections, parasites, and bacterial/viral infections. Newer and experimental research shows berberine as having varying effectiveness on the cardiovascular system and anti-inflammatory activities. The amur cork tree (Phellodendron amurense) contains the yellow alkaloid berberine in its foliage. Berberine is strongly colored yellow, which has led to many plants with this compound being used for dyeing wool, leather and wood from ancient times onward. The yellow is typically within the roots or stems of plants containing this substance. When we see yellow in flowers or leaves, that’s xanthophyll, a pigment created within leaves and believed to aid in protecting chloroplasts (the green units in plant cells) from excess solar radiation. Xanthophyll is masked by the green-colored chlorophyll until autumn, or when a leaf is dying (senescing, from such causes as lack of light, excess water and/or drought). Yellow in flowers, however, is due to carotenoids, accessory pigments that aid photosynthesis in absorbing wavelengths not captured by chlorophyll. 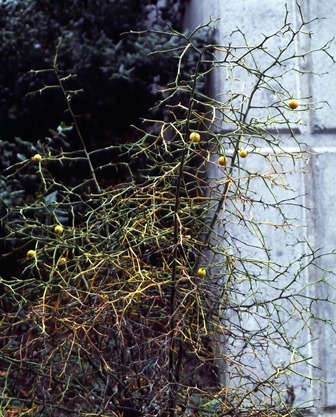 The yellow-tinged bark of Berberis is due to this alkaloid, berberine. Some people suffering from diarrhea associated with Crohn’s disease have sought relief from Berberis extracts, for instance. Barberries and Oregon grapes have long been noted for their edible fruits. Although the “grapes” of Berberis are not sweet, I’ve had Oregon grape wine—it’s like a fine Reisling—and have been served sides of red barberry fruits/seeds in Persian restaurants to sprinkle over chicken and/or lamb. Filled with Vitamin C as it is, berberine adds to the meal’s healthfulness. Another source of berberine is goldenseal (Hydrastis canadensis), which is touted as a homeopathic remedy ranging in suggested uses from a topical antimicrobial to a digestive aid, and as a boost to the medicinal effects of other herbs. Native to the northeastern United States and adjacent areas of southeastern Canada, it has been overharvested to such an extent that it is rare in many former locales and is listed as an endangered species. This woodland perennial, of the buttercup family Ranunculaceae, features a yellow bumpy rhizome. Other common names include orange root, yellow root, yellow puccoon, ground raspberry, and jaundice root. It’s quite a plant for the ornamental garden, rising to 12 inches, with two large palmate leaves, each with five to seven deep lobes. The single, small inflorescence rising above the foliage eventually bears a single raspberry-like reddish fruit. 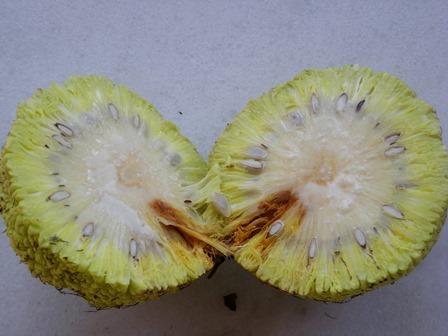 The wood and interior of the fruit of the Osage orange tree (Maclura pomifera) have yellow coloration. Of much greater beauty is its close Asiatic relative, Glaucidium palmatum, the Japanese wood poppy. This Japanese plant bears an exquisite, large, deep-pink to purple flower (composed of four sepals) barely rising above the large, serrated, palmate leaves. A white-flowered form is also to be found, and both are about 20 inches in height. As a woodland plant, it blooms about the same time as Trillium and Erythronium (trout lilies). Glaucidium is said to have similar herbal attributes as goldenseal. Berberine is also to be found in the foliage of the Amur cork tree (Phellodendron amurense), a member of the Rutaceae (citrus family). 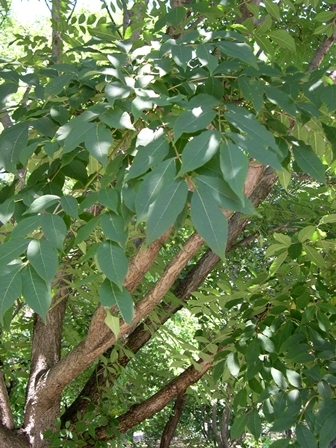 This deciduous, large, pinnate-leaved tree is native to northern China, Manchuria, Korea and Japan. Not surprisingly, it is used in Chinese traditional medicine for a number of treatments. Winter interest is highlighted by an often-twisted trunk with deeply furrowed bark, which seemed similar enough to that of the cork oak to give it its common name. Clusters of pea-sized black fruits (drupes) will be found only on female trees, as this species is dioecious (that is, the male and female reproductive organs are borne on separate plants). Fairly pest free, it’s a small tree up to 40 feet in height, is very hardy and displays a yellow fall color if sited in a sunny location. A member of the mulberry family (Moraceae) with a golden interior is the interesting tree Maclura pomifera, or Osage orange. I first learned of it while tending the garden of an art professor who took his family on an extended summer road trip during my junior year at Wabash College in central Indiana. I was to use a riding mower on all the lawn except under the two large Osage orange trees, where I was told to use a push mower and to wear heavy- soled boots. One needed only to see myriads of rather large, vicious spines that fell from the branches above to see why. Trifoliate orange (Citrus trifoliata) has yellow interior wood, along with yellow fruits. The common name, “orange” makes sense as the fruit resembles an overlarge, light-green grapefruit. However, when I tried to open up a fruit to extract some seeds, it was not only difficult to cut into but also full of a sticky latex-like compound. The Osage part of the name refers to the homeland of the Osage tribe, centered in southwest Missouri, northwest Arkansas, southeast Kansas and northeast Oklahoma. The French first recorded the tribe’s homeland border in 1673 and these partially overlap the native range of this plant. The Osage tribe found the wood a wonderfully strong and pliable choice for bows; they kept a monopoly on the export of the branches, realizing its advantage over other woods. Settlers, though, found other outstanding features of the plant, namely its tremendous rot resistance, and those thorns. This wood was a natural for creating fences and evidently led to the development of barbed wire in 1867, when Lucien B. Smith of Kent, Ohio, patented the thorn shapes in a metallic form. Even after the introduction of barbed wire, the posts were still utilized, as were other long-lasting woods such as black locust and chestnut. Osage orange became the most planted tree in 19th century North America as a result of these features; hedges and windbreaks were other common uses. Today, Osage orange is used in the landscape as a small tree up to 30 feet high with a picturesque, deeply furrowed bark. It is extremely hardy, so one finds it planted all through the Plains states up into central Canada. Almost pest free itself, recent studies find active ingredients within Osage orange repel insect pests just as effectively as the synthetic repellent DEET. The wood inside is a beautiful deep yellow with a fine grain. I’ve seen some handsome wood sculptures and artful pieces fashioned by wood carvers in Kentucky and Illinois. Originally this plant was widespread, but by the time Lewis and Clark gave Jefferson cuttings (which had been given to them by Pierre Chouteau of St. Louis, who had lived among the Osage for a time), it was found only in southeast Oklahoma, east Texas, southeast Arkansas and the extreme northwest tip of Louisiana. How did such a plant become so restricted to a small geographic area? With the large bitter fruit up to five inches in diameter, no bird or animal today seems a likely candidate to be able to spread the seeds. Alaska yellow cedar (Xanthocyparis nootkatensis) displays a wonderful honey tone in its foliage and also has attractive yellow inner coloration. The answer may lie in some recent work on extinct animal dung (coprolites) from the Pleistocene Epoch. Animals with large mouths and digestive systems, such as giant ground sloths, mammoths and mastodons, would all have had the opportunity to feed upon the fruits and thus scatter the seeds. This possibility is demonstrated by the fact that elephants and horses, when fed the fruit, are able to eat them. Another candidate for a thorny hedge is the hardy orange, sometimes known as the trifoliate orange. Poncirus trifoliata (now changed to Citrus trifoliata) is indeed hardy (USDA zone 5) but unfortunately for those willing to grow a citrus relative outdoors, it produces rather disappointing fruits. Small mandarin-sized fruits will appear but they are seedy inside, rather dry and extremely sour. Marmalade, though, can be made using the peel and pulp. Various Chinese herbal uses are also attributed to the fruit. This shrub’s thorns are so formidable that it is used to landscape Fort Knox, the site of a large portion of the nation’s gold bullion. Easily reaching 15 feet in all directions, this plant demands not just elbow room, but respect. ‘Flying Dragon’ is a curious dwarf form often seen in containers; the name is due to its extra twisted and fused green branches. Two other native plants with attractive inner yellow coloring are the Alaska yellow cedar (Xanthocyparis nootkatensis, previously known as ). It is a scale-type conifer that displays a wonderful honey tone and a piquant odor of vinegar as well. Besides being attractive, the wood is easy to work with and is often used in wooden boats, where its rot resistance is valued. 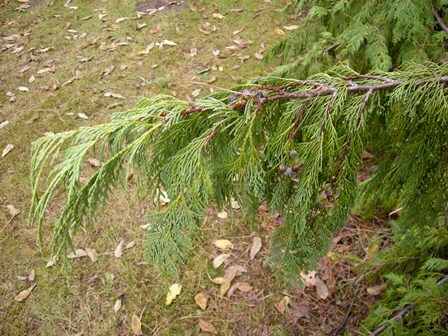 As a landscape plant, Alaska yellow cedar is most often seen in its pendulous form (Xanthocyparis nootkatensis ‘Pendula’), with the side branches growing extremely long and slender in a typically narrow outline. The yellow-green drapery gives the tree an elegant shape, no matter what the size. Landscape plants will normally reach 20-30 feet in the Pacific Northwest; some of the narrowest may be no more than six feet wide at those heights, making for a striking silhouette. 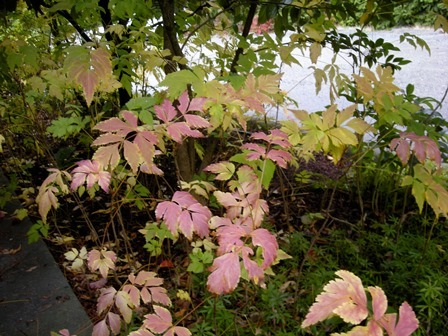 Yellowroot (Xanthoriza simplicissima) displays yellow coloring above and below – in its fall leaves and roots. Goldthread (Coptis species) is an underused groundcover in our area. I’m reminded of the common name when I happen to dig through a patch and see the intense yellow of the slender roots. For those small, shady spaces where vinca or a euonymus might overpower nearby plants or spill over into the path, goldthread is worth considering as a quiet, dignified evergreen. Also in the Ranunculaceae (buttercup family), it too has berberine. With species found both in North America and China, it was used by indigenous peoples in both regions for treating a variety of ills and is still part of the Chinese pharmacology. With at least three local species, one differing little from another, you can’t go wrong with this genus. One other plant I’ve run across with yellow inner wood is the aptly named yellowroot or Xanthorhiza simplicissima. Xanthos is Greek for the color yellow; rhiza refers to the roots. Very few of the Ranunculaceae (buttercup family) are woody, but this one rises to two feet, with a crown of long, pinnate, leaves and long, pendant panicles of purplish flowers. Native to the eastern United States from Maine to Florida and westward to Ohio and Texas, this sub-shrub was utilized by Native Americans to produce a yellow dye. It thrives in dappled light and slightly moist soils and is useful for knitting together slopes with its spreading underground roots. Yellow above and below—it is the color we associate with myriads of fall plants displaying the pigment xanthophyll, previously masked by the green chlorophyll. It is also to be found inside an egg when we break it open to reveal that brilliantly colored yolk. From the visual, through various pharmacological uses to the gustatory— what a color! Walt Bubelis serves on the Arboretum Foundation Board and the “Bulletin” Editorial Board.